Has your site ever been hacked? Do you even know if it has? Many websites are hacked, and not for the reason you may think. Hackers are not interested in your company, your clients or even what is on your website... They want access to your website so that they can upload phishing sites to a folder on your website, and the bad news is that you probably dont even know it. They use these sites such as fake banking sites, fake paypal or fake itunes sites to gather clients information. They send out a spam email to a list that they acquired, and people click on the link and enter their details. This in turn gets your website black listed on google, and all your indexed links may be removed. 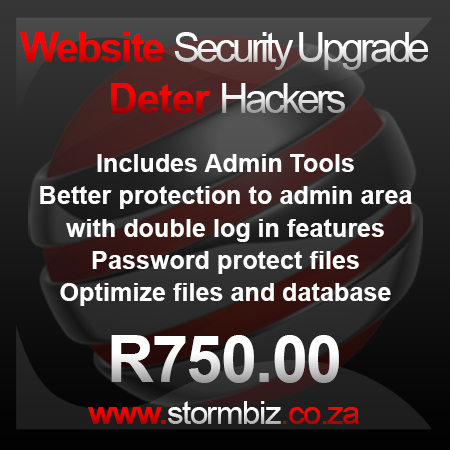 Your host may even put your site offline, or worse, terminate your account to protect the other users on your server. We will upload Joomla Admin Tools (Security Software) to your website, configure it to protect against such vulnerabilities, and ensure that your site is safe from hackers.